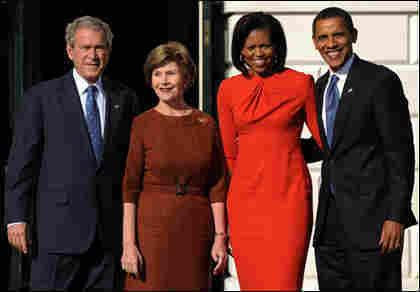 The Obamas Drop In On The Bushes : Tell Me More President-elect Barack Obama and his wife, Michelle, are meeting behind closed doors with President George W. Bush and First Lady Laura Bush. As I'm posting this entry, President-elect Barack Obama and his wife, Michelle, are meeting behind closed doors with President George W. Bush and First Lady Laura Bush. Although Mr. and Mrs. Bush have both called to congratulate the Obamas on winning the U.S. presidency, this afternoon's face to face meeting is a first since last week's election. The Obamas' young daughters, Sasha and Malia, are not in attendance. The meeting is an attempt to show that the presidency should be above partisanship but it also serves as the future commander-in-chief's first major step forward since emerging as the victor in a long and, often, tense race to the White House. So, what are they talking about in there? Earlier today, White House press secretary Dana Perino described the agenda for the visit, during which include Laura Bush will give Michelle Obama a personal tour of the Executive Mansion, as "very private." We may never know everything that was discussed today. We can live with that. But, seriously. We all know that this past campaign season wasn't exactly the bipartisan love fest that today's meeting -- judging by the photo above -- might attempt to convey. Remember, Obama's "more of the same" slogan describing his Republican opponent Sen. John McCain --- the "same" being President Bush? And, President Bush, although not surprisingly, supported fellow Republican McCain's presidential bid over Obama's. The point: the two families are not the best of friends. Of course, the visit is part of the changing of guard, and has been a tradition for years, but one can't help but wonder if there's any awkwardness in the air during the short visit. Would you feel awkward during such a "visit" -- as either the host or the guest? And, what do you think they're talking about, aside from essentials explicitly related to the transition? It's not like they can go and meet the neighbors. But maybe they really are laughing, hugging and singing "Kumbaya."